Golconda Fort Sound & Light Show. Another feature that makes Golconda fort all the more attractive is the light and sound show presenting its history and facts. The sound and light show at Golconda Fort is done in English with a voice over of Bollywood living legend Amitabh Bachchan. 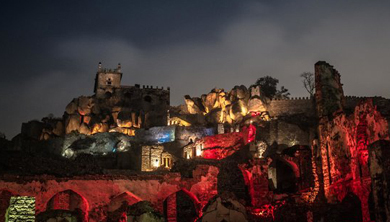 The show timings of sound and light show at Golconda Fort are Show Timings (Nov to Feb): 1st Show 6:30pm 2nd Show 7.45pm & Show Timings (Mar to Oct): 1st Show 7:00pm 2nd Show 8.15pm. You have to pay extra if you are planning to take your camera inside. 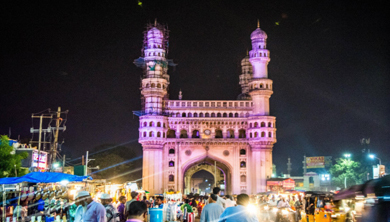 The Charminar Area Walk will highlight the history of the two dynasties that ruled Hyderabad. We will take you to Charminar, Laad Bazaar, Mecca Masjid and Chowmahalla Palace. From the story of the creation of the city in 1591 till the end of the Nizam's rule in 1948, this tour is a must-do for any first timer to Hyderabad. It includes historic monuments, colorful bazaars and will give the visitors a glimpse into the life of a typical Hyderabadi. No place can give you a glimpse of Hyderabadi life like the Charminar area can. It is a brilliant mosaic of history, culture, modernity, crafts, business and old world charm - a perfect slice of this city's life. Heritage Walk with Hi-Tea at Falaknuma Palace. 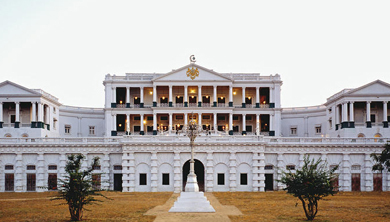 known for the bangles market, then join a walking tour of Falaknuma Palace. Top off your tour with high tea in the elegant palace for the ultimate sightseeing experience. 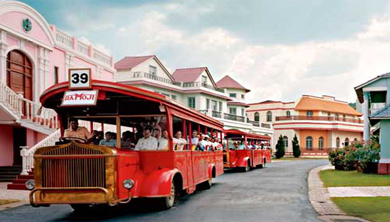 Ramoji Film City is a combination of worlds within a world. This theme park is not just outstanding for the range of activities but is so colourful that it will make you want more. Whether it is shopping, stunning nursery, restaurants or activities that will wow your child, RFC has it all. Get ready to explore the fun and adventure with our day tours to Ramoji Film City. Hyderabad Old City Food Walking Tour takes you to the most historical part of Hyderabad in the Charminar area. Combining a walking tour with food tasting will be a unique experiences for you to learn more. about the history as well as the food culture in Hyderabad. 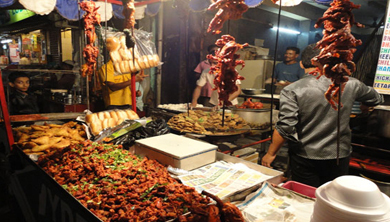 In this food walking tour, we will explore one of the oldest vegetable markets, make our way through some of the best breakfast snacks in town, participate in the Hyderabadi pastime of sipping cups of Irani tea with Osmania biscuits, bite into warm, just baked local bread and watch the efforts that go into preparing some of the best delicacies this region has to offer.